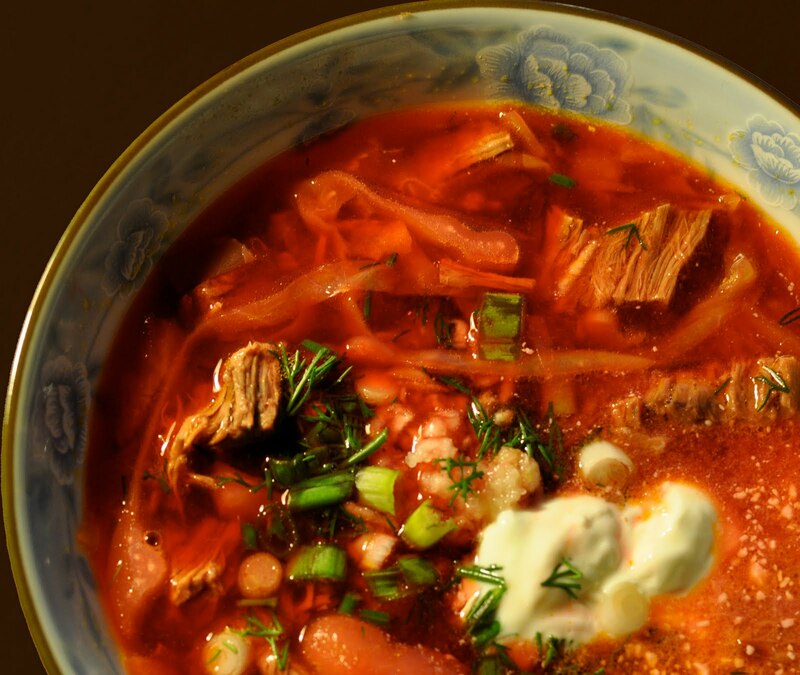 If you know of Russian food, you've heard of Borsch. It is popular not only in Russia, but also in Ukraine - its motherland - and in a number of East European republics. Naturally, this dish abounds with regional variations (as well as alternate spellings: bortsch, borstch, borsh, borshch...), so I will not claim that this is the only way to cook it right. This is, however, the way that it has been cooked in my family for generations. 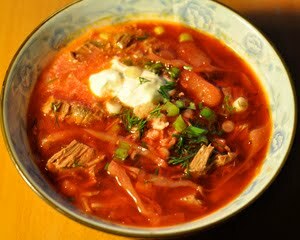 And I will tell you about the one and only borsch that for me abounds with memories, the one that makes me remember who I am, and helps the kitchen that I cook in grow to be my home. I don't have exact proportions for any of this, because, quite frankly, they don't matter that much, and measuring to make borsch seems somehow against its hearty rural spirit. Pour about 2 liters of water into a large pot, place the meat in and set on high heat. When the water starts to boil, you will see a lot of foam accumulating on the surface. 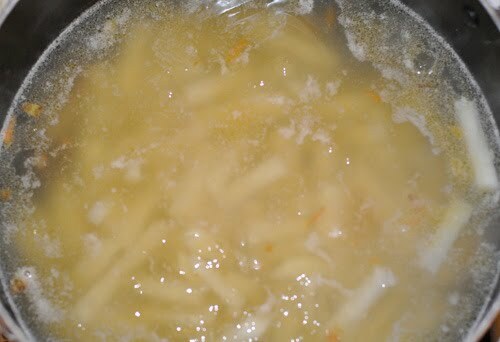 This is the result of protein boiling out of the meat and will cause a murky broth if nothing is done to prevent this. 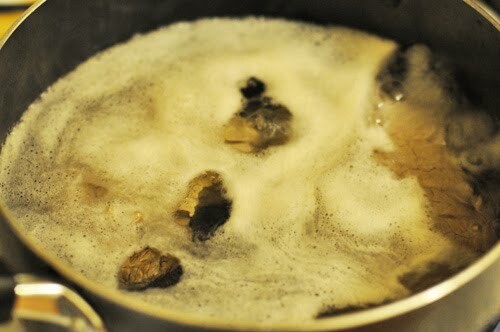 Let the water boil for several minutes, then discard the cloudy water, wash the pot and the meat and fill the pot anew. Set on high heat. This time, you will see a lot less foam (see picture). Remove it with a large spoon and discard. The foam will continue to form for about 10-15 minutes. When it stops accumulating, put in a whole peeled onion, a whole peeled carrot, capricorns, bay leaves and salt to taste. Set on medium heat and let boil lightly until the meat is very tender and the knife pierces it easily (about 2 hours, depending on the quality and thickness of the meat). When the meat is done, transfer the meat to a different container, strain the broth. 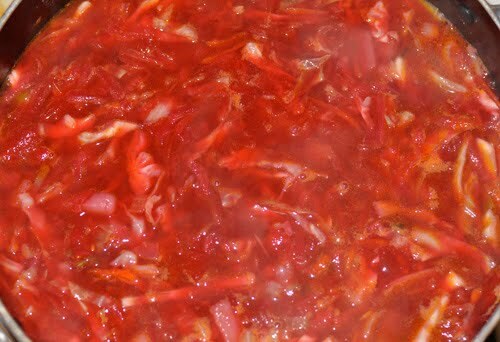 Straining may not be necessary if the broth looks clear and the onion has not fallen apart. The borsch is cooked in three separate parts, so you will need one big pot for the soup, one medium pot for the beets and one pan. Peel and shred beets using a rough shredder. Raw beets are rather tough, and this is not a pleasant job. Place the bits into the smaller pot, add finely chopped tomato, enough water to cover the beets and tomato paste. Mix and set to simmer on medium heat. 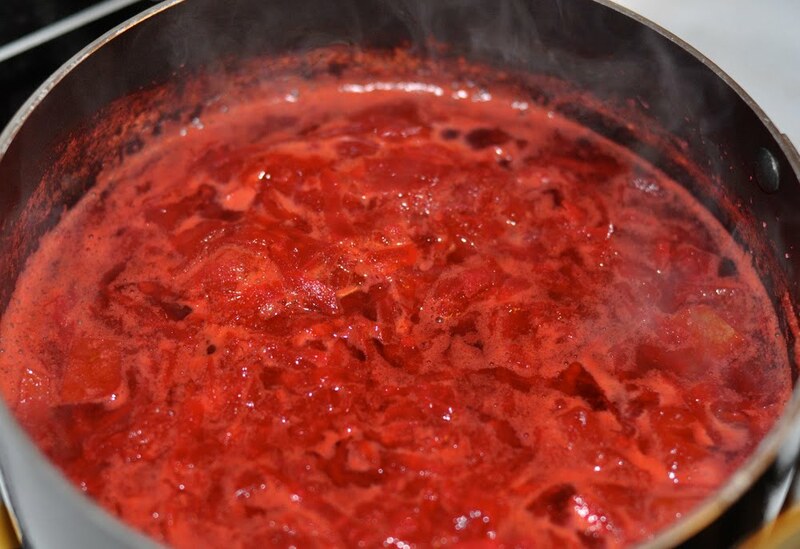 This way of cooking beets together with the acidic tomatoes preserves their vibrant magenta color. 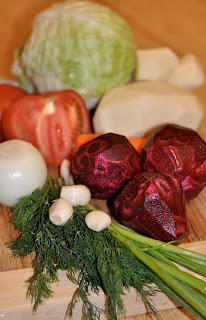 If you add uncooked beets directly to the main pot, they will result in a washed our red. Let the beets simmer on medium heat for about 40 minutes or until done. 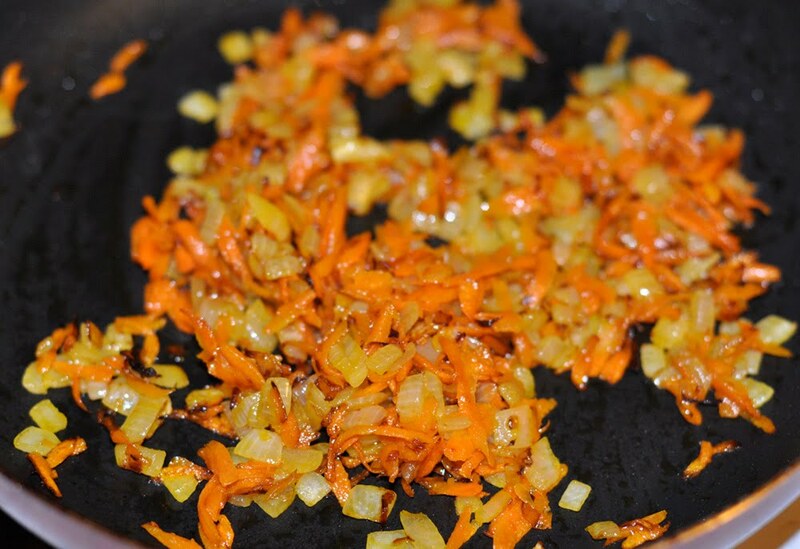 Shred the carrots using the same shredder as for beets, finely chop the onion and fry in olive oil until golden brown and fully cooked. Set aside. If you chose lean meat for the broth, this will provide most of the fat in the soup. The final step is assembling the soup in the big pot. Set the broth in a big soup pot (make sure it's big enough for all the ingredients to fit) to a boil. If at any point the soup becomes too thick, just add boiling water. 1. Add potatoes, cut into elongated pieces (almost like french fries). Let the broth boil lightly until the potatoes are almost done (about 10 minutes). 2. 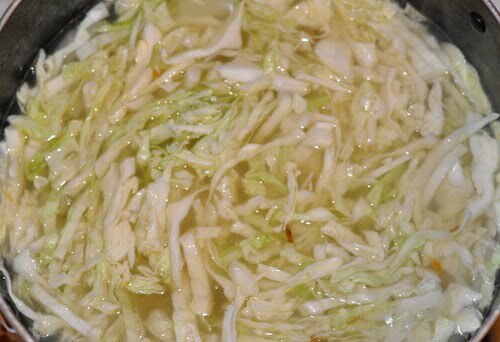 Add cabbage cut into thin straws, not too long. Wait until the broth begins to boil and boil lightly for at most 2 minutes. Cabbage cooks quickly. 3. Now, pour in the beets from the smaller pot and the carrots from the pan. Mix, add salt to taste and bring to almost a boil. Turn the heat off, throw in some dill and maybe some chili flakes (this part not traditional, but I like to do it), cover the pot and let stand for 5-10 minutes. 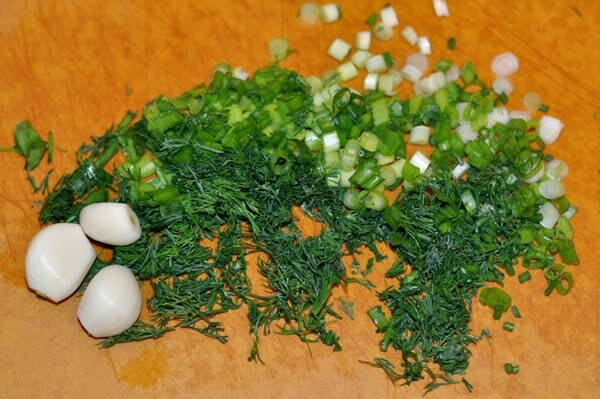 Just finely chop some dill and scallions. The garlic should be shredded finely just before serving. 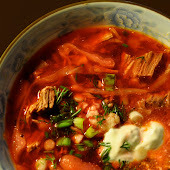 Borsch can be made with vegetable broth or even water for a vegetarian option.